Our energy environment is changing rapidly as Governments globally strive to make cost efficient use of existing resources while enabling the emergence of a low carbon economy. Innovative policy is crucial to enabling the emergence of those technologies that will deliver this. At an important juncture for the success of mCHP, this report by key mCHP stakeholders aspires to set a framework for constructive discussion with a wide range of policy stakeholders on the technology’s potential to contribute to energy policy objectives. The report also seeks to serve as a basis for cooperation with industry stakeholders, including leaders in the distributed and smart energy sectors and distribution network operators, to examine synergies such as the undertaking of flagship distributed generation projects. download/read more. This Guide to Successful Implementation of State Combined Heat and Power Policies is designed to inform state regulators, facility operators, utilities, and other key stakeholders about the benefits, costs, and implications of greater use of combined heat and power (CHP). Achieving greater use of CHP is consistent with President Obama’s Executive Order 13626-Accelerating Investment in Industrial Energy Efficiency, which calls for 40 gigawatts (GW) of new, cost-effective CHP by 2020. download/read more. The next two decades will see substantial changes in the way electricity is generated in the United States. As coal loses favor to natural gas and other alternatives, utilities will retire a significant portion of their coal fleet and invest substantially in other energy resources around the country. This report targets 12 U.S. states and ascertains the likely amount of coal-fired electric capacity to be retired in the near term plus the potential for CHP to meet some of that lost capacity. download/read more. Combined Heat & Power A Clean Energy SolutionRecognizing the benefits of CHP and its current underutilization as an energy resource in the United States, the Obama Administration is supporting a new challenge to achieve 40 gigawatts (GW) of new, cost-effectiv for national discussions on effective ways to reach the 40 GW target, and includes an overview of the key issues currently impacting CHP deployment and the factors that need to be considered by stakeholders participating in the dialogue. download/read more. It’s not entirely a new idea. We started talking seriously about cogeneration back in the 1970s. The idea was to find a use for waste heat from the engines or turbines used for on-site electric generation. This concept has found many adopters, and today is getting a serious foothold in the industrial energy market. 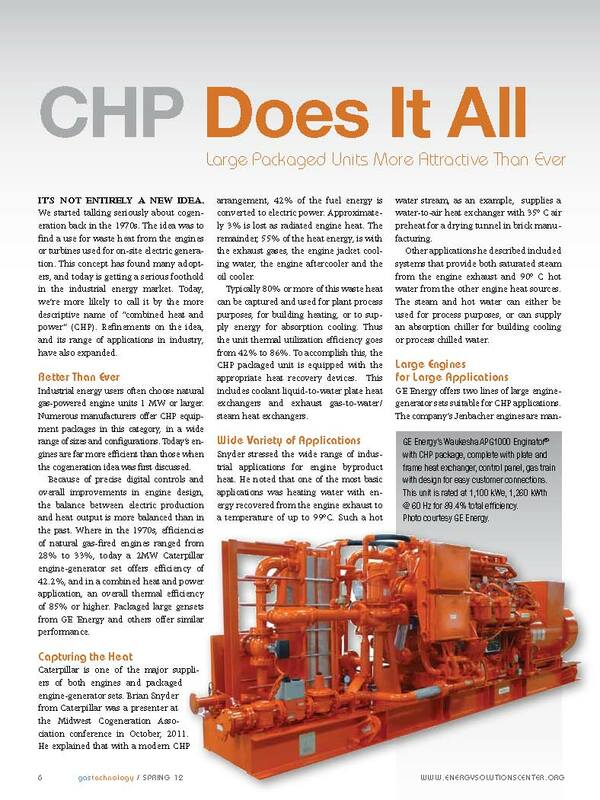 Today, we’re more likely to call it by the more descriptive name of “combined heat and power” (CHP). Refinements on the idea, and its range of applications in industry, have also expanded. download/read more. 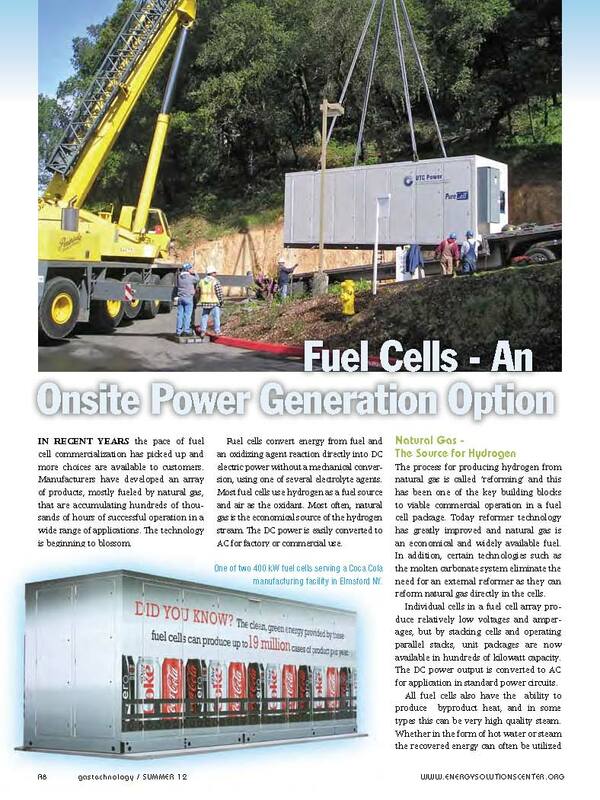 In recent years the pace of fuel cell commercialization has picked up and more choices are available to customers. Manufacturers have developed an array of products, mostly fueled by natural gas, that are accumulating hundreds of thousands of hours of successful operation in a wide range of applications. The technology is beginning to blossom. download/read more. It’s a great idea: Generate your own electric power for use in your plant or on your campus, and use byproduct heat for space heat, water heating, process heat, absorption cooling — almost any thermal application. If you have surplus electric capacity, it can be sold back to your utility. 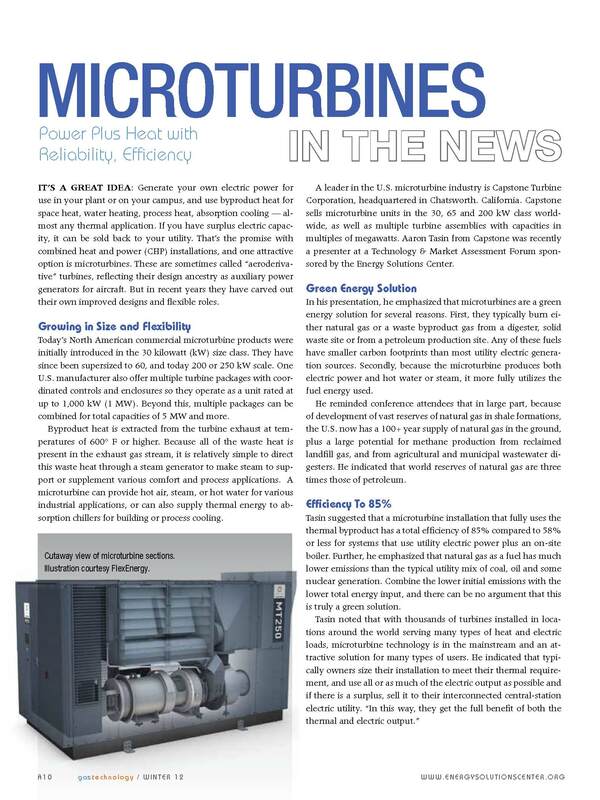 That’s the promise with combined heat and power (CHP) installations, and one attractive option is microturbines. These are sometimes called “aeroderivative” turbines, reflecting their design ancestry as auxiliary power generators for aircraft. But in recent years they have carved out their own improved designs and flexible roles. download/read more.